From the January 31, 1948, issue. 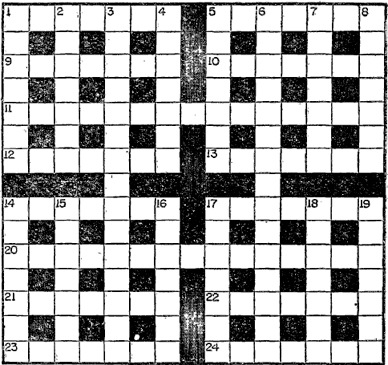 ACROSS.--1 CHANCEL; 5 INFECTS; 9 ADHERES; 10 CORDIAL; 11 FAIRY GODMOTHERS; 12 DEMANDS; 13 SPIRAEA; 14 ADDICTS; 17 AMULETS; 20 COMPANY DIRECTOR; 21 SPANGLE; 22 ALABAMA; 23 DESISTS; 24 ESTATES. DOWN.--1 CHAFFED; 2 ATHEISM; 3 CARRYING CHARGES; 4 LESSONS; 5 INCOMES; 6 FIRST LIEUTENANT; 7 CHIMERA; 8 SILESIA; 14 ACCUSED; 15 DEMEANS; 16 SHYNESS; 17 AGITATE; 18 EXTRACT; 19 STREAMS.